If you are ever in an avalanche here are three people you don’t want to be responsible for digging you out. According to an article posted on industry site Skiingbusiness.com the group of four was sharing two avalanche beacons and two packs between them. 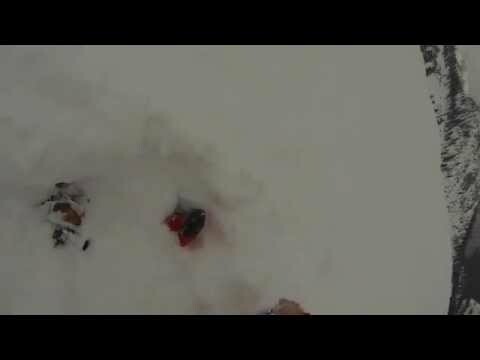 Fortunately the skier caught in the avalanche was wearing a beacon and had a foot sticking out of the debris which meant he was easy to locate. Had the rescue been any more difficult the 120 seconds it took for the searching transciever to be removed from the female skiers jacket and passed to the group leader could have been crucial. So next time you’re riding out of bounds remember that every member of your group having a beacon/transciever, a pack with a shovel (with a handle) and probe and the confidence/experience to use them is absolutely essential. If you need a brief introduction to the basics of avalanche rescue use this fantastic online guidebook provided by Ortovox.